Craig Mercer has done what most can only dream of. Mercer rocking out with the now-defunct JSB. (Flickr: davemmet). By the time he was a teenager, Mercer was making close to $500 a week, playing covers in bars around his native Cape Breton. After graduating with a degree in philosophy from Dalhousie University, he decided to focus on music full time, realizing playing in his band PF Station was more fun than sitting behind a desk every day. And now, as a rocker settling into his late-30s, for the first time in his life, he’s getting a real job. That’s because in early November, after years of running NSCC’s Music Business Program, Waye Mason stepped down as head of the department when he was elected city councillor. Mason left not only a hole in the local music scene, but one of the province’s most exciting post-secondary programs. So when you need to a find a replacement for Halifax’s biggest scenester, you better find someone who loves that scene just as much. 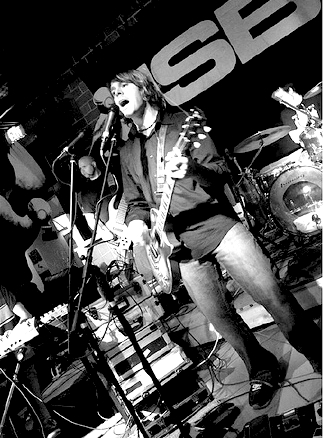 Ever since the early days of The Jimmy Swift Band, Mercer has been at the forefront of the Halifax music scene. After graduating from university and being upset with his inability to find a good agent in the city, he became one himself, managing acts such as Grand Theft Bus, Slowcoaster and the Wassabi Collective. His experience lead to jobs as an entertainment director, booking gigs at The Blues Corner, The Marquee Club and the Paragon Theatre, which he opened with friends in March 2009. But after the Paragon closed its doors in May 2011, Mercer was ready for a change. “The idea of a steady job was starting to appeal to me,” he says. So when a job posting at NSCC went up in late October, Mercer jumped at the chance. In music business, Mercer is in charge of 24 students over the course of the one-year program, giving students hands on experience in small group sizes. Expanding on Mason’s curriculum — which runs students through volunteer positions at the Halifax Pop Explosion, to music nights at the Company House — Mercer has joined forces with NSCC’s photography and graphic design programs for “Professional Practice.” In conjunction with Music Nova Scotia, the program has taken five local bands and artists under its wing, allowing students to create press packages, manage their online presence and even book them shows. And even though it may not be as exciting as his early days touring across Canada, working at NSCC has brought him a new passion too.